Scott Addington is definitely thinking outside the box when it comes to new ideas for encouraging engagement with the centenary of the First World War. He has developed the app ‘The Great War 100’ (one of currently very few high quality First World War apps out there – see my review here) and has several further publications in the pipeline, including a series of ‘Five minute histories’. Sometimes I think that those of us who are passionate about the history of the First World War and engage with it on an almost daily basis forget that not everyone shares our interest. Yet of course many people’s knowledge may be limited to some of the commonly-held perceptions and myths about the war or to what they remember from the classroom. With the centenary fast approaching we have the chance to rectify this, to stimulate interest in the events of a century ago and continue to ensure that those who were involved are remembered. Accessibility is key here, and it is important to ensure that information is available at all ‘levels’; many people will not be interested in the details of a particular battle or campaign being picked apart, or a reassessment of command during the war. Instead they will want an easy introduction to what can be an incredibly complex and diverse subject. At a price of just £1.53 and easily downloadable to Kindle, ‘A Layman’s Guide’ certainly provides this accessibility, its target audience those with little prior knowledge who would prefer a more conversational style to a weighty academic tome. Addington makes no apologies for this, even stating that “…people who hold a decent knowledge of the subject should perhaps walk away…as you are not the intended audience”. At 160 pages the book is easily digestible, and is broken down into short sections of no more than three pages. Essentially a chronology of the war broken up by snippets about subjects such as trench life and the use of tanks, it is ‘basic’ without being patronising or preachy. The focus is predominantly the western front, although Gallipoli and the eastern front warrant a mention; it is difficult to envisage how even a basic introduction could ignore them given their overall importance to the course of the war. A short list of suggested further reading is provided, along with a number of useful websites. Whilst it could be argued that it is difficult to adequately summarise events such as the Somme offensive in just three pages, the book covers the key points clearly and concisely. Its remit is not to cover the details of strategy and tactics, and if it acts as a ‘signpost’ for readers or whets their appetite to find out further information then it has done its job. As an introduction to the conflict perhaps a summary of for example combatant nations and casualty statistics, and a map of the western front, would have been useful. However saying that the ‘Great War 100’ app covers these areas and would provide a useful reference tool when reading this book. 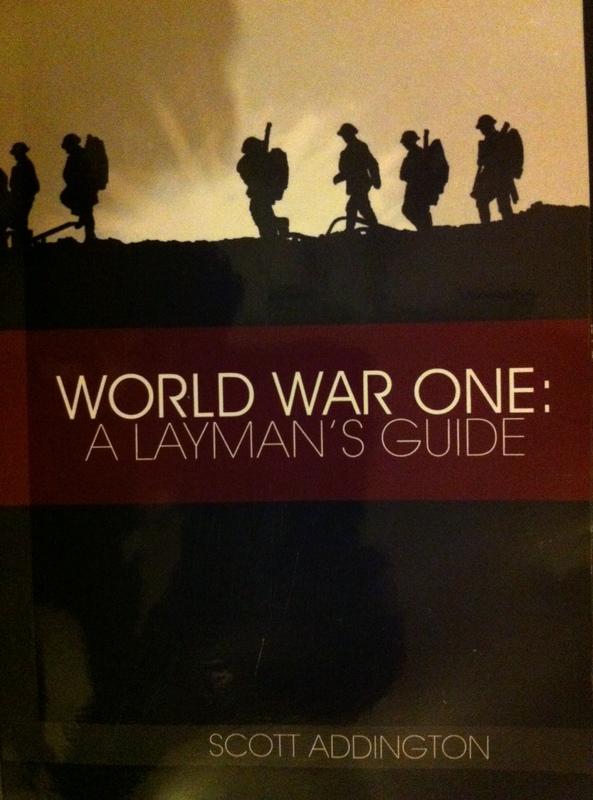 World War One: A Layman’s Guide; it does exactly what it says on the tin!